SWANNY’S MATCH VERDICT: Oldham 2, Peterborough United 0: Seven days to save the season? Marcus Maddison sums up Posh feelings after the final whistle at Oldham. Photo: Joe Dent/theposh.com. The January transfer window shuts in seven days. And while manager Grant McCann stated publicly (minutes after understandably expressing ‘disgust’ at the Posh performance in defeat at Oldham) he was ‘happy with his squad’, one suspects he will be singing a different tune in today’s (January 25) sit-down with chairman Darragh MacAnthony and transfer guru Barry Fry. Posh full-back Michael Smith gets a grip on Oldham's Ryan Flynn. Photo: Joe Dent/theposh.com. Miserable stat is piling up on miserable stat right now, and the chairman likes a stat. Posh have won one of their last six League One matches and five have been against teams currently in the bottom eight. Posh have not scored more than one goal in any of those six matches, and they included home matches against a woeful Gillingham defence and rock bottom Coventry. ‘Star’ man Marcus Maddison hasn’t scored since October 8. It’s unlikely the club will even be able to cash on his mercurial talent, given form that included an inability to strike a decent corner last night (a huge disappointment as set-pieces were always likely to be crucial on such a terrible playing surface). Marcus Maddison claps the 442 Posh fans at Oldham. Photo: Joe Dent/thrposh.com. But it would be wrong to single anyone out. This was collective incompetence, which can happen, borne from an apparent lack of passion and commitment, which should never happen. It was clear in the opening stages that a fired-up, yet severely limited home side, boosted by a relatively big crowd attracted by free admission and the return of potty-mouthed local hero John Sheridan, possessed a level of aggression and fight that could overwhelm McCann’s men. Oldham won a couple of 40-60 tackles in the opening minutes and never looked back. Only the lack of quality in a squad that had scored a barely believable 13 goals in 26 League One matches before last night, stopped Oldham turning their physical superiority into goals until the last quarter of the game. It even took a questionable penalty decision for an apparent piece of holding by right back Michael Smith in the 67th-minute to get Oldham in front. Not that the Posh players even had the heart to ask their questions of a fussy referee too loudly before Paul Green sent Luke McGee the wrong way from the spot. A second goal eight minutes from time, created by Aaron Amadi-Holloway and converted with ease by Ryan McLaughlin, completed a scoreline that in no way flattered Oldham. The fact that the move started deep in their own half after skipper Chris Forrester and substitute Paul Taylor had collided confirmed the Keystone Kops nature of this Posh performance. Posh were truly terrible. They were far worse overall last night than in the 5-1 thumping at Bury 10 days earlier. There are issues up top as 27 games into the season and there is still no sign of a workable strike partnership, but Messi and Ronaldo might have struggled as Posh forwards at Boundary Park such was the paucity of the service to Tom Nichols, one of the few to show a semblance of ball control, and Lee Angol. Nichols moved well without receiving an accurate pass all night, while Angol, and Taylor when he replaced the big man, dropped deeper and deeper looking for some action. 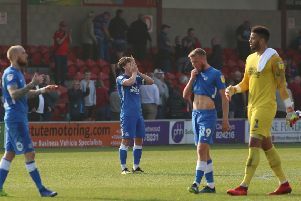 The first-half was so poor a free game appeared over-priced with Peter Clarke hooking a half-chance over the bar for Oldham before home keeper Connor Ripley dropped a Maddison corner, but recovered to grab the ball as several Posh players looked on. Posh can look horribly one-dimensional when things are going badly. They persisted with their square and backward passing on a surface that would have tested the technique of far superior players. McCann also made like-for-like substitutions when a change, a gamble even, was surely called for. Quite why Martin Samuelsen has been brought back to the club on loan when he can’t get a game in a side playing this poorly is mystifying, and may well be questioned when the last transfer target meeting takes place. Summer signing Brad Inman will be another to believe he has a chance of starting a game soon. After a performance this dreadful mitigating circumstances are hard to find. A fifth away game on the bounce, and over 1,000 miles travelled this month, is the best one can put forward. A decent return from five home matches in the next seven matches would ensure this night was forgotten, but Posh have won just five of their 13 League One matches this season so nothing can be taken for granted.